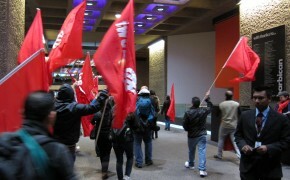 The Independent Workers Union (IWGB) welcomed the announcement by the City of London Corporation that catering contract staff are to be paid at least the London Living Wage of Â£8.55 per hour in it Barbican Centre and neighbouring Guildhall School of Music. 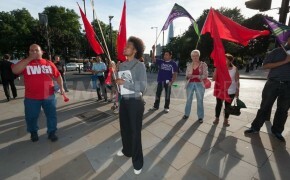 The militant cleaners of the Industrial Workers of Great Britain (IWGB) once again launched a surprise demonstration against racist bosses on Friday 3rd May. 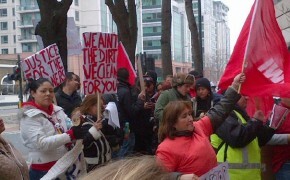 The migrant workers are fighting bullying managers and standing up to racism and sexism in the workplace. 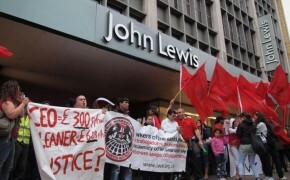 The independent union, the Industrial Workers of the World (IWW) has today served notice for strike action of cleaners at the John Lewis Partnershipâ€™s flagship Oxford Street store. 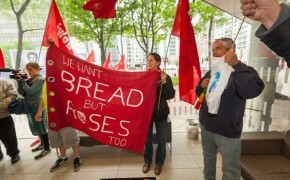 This is the first strike in the history of the Partnership only recently hailed by Deputy Minister Nick Clegg as a model for the British economy.